Now, I’d like to do something a little different for “Iwata Asks.” We had a massive amount of debuggers play Skyward Sword for hundreds of hours. Play time of 600 to 700 hours was common, while some played as much as 1,000. Usually after playing something that much, you wouldn’t ever want to see it again! But they all said they want to buy it and play it again when it comes out. They really did. And they weren’t just being polite. When I heard that, I became incredibly interested in exactly what it was they felt while debugging. What I would really like to do is invite them all and talk to them, but that’s not feasible. 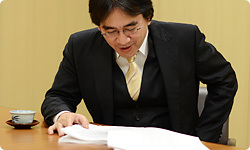 So I proposed having them write down their opinions and reactions in order to participate in this session of “Iwata Asks” virtually. Kind of like a session of “Iwata Asks: Mario Club.6“ 6Mario Club Co., Ltd.: It conducts debugging and testing on Nintendo software during development. Yes. We received comments from Mario Club Co., Ltd. in Japan and various people involved in debugging and translation and so on from America, Europe and South Korea. I’d like to introduce some of those comments and talk about them. "This game was more interesting and fresher the more times I played it - in my second and third rounds. I’m fascinated by how hard it is to come up with an explanation for that." This person from South Korea played 880 hours. Yes. (laughs) I can understand that the game gets more interesting the more you play it, but this also says it stays fresh. Usually, when you repeatedly play parts you already know, they get old. Someone from Europe provides a concrete reason for that. "There are different ways of solving puzzles, but I’m always surprised when I find a new way to defeat an enemy. When I change the way I do something, or do things in a different order, or move a different way by chance, I make new discoveries." This person finds a new way of defeating enemies every time. Could that be because the Wii Remote Plus7 controller increases the game’s expressivity and variation? 7Wii Remote Plus: An enhanced version of the Wii Remote controller with the Wii MotionPlus accessory built in. Released in November 2010. I think so. There’s an infinite number of combinations, so when you play it multiple times, your skill improves and you naturally do something different even in the same place. And when you try something new, you make a new discovery. So that’s why they still want to play even after hundreds of hours. They can sense that there are things they haven’t done yet. I think that is without precedent for single-player games. During debugging, I played the same places multiple times myself and didn’t mind. "Something I have always enjoyed in the Legend of Zelda series so far is solving puzzles. In addition to that, this game has the considerable appeal of enjoying fights. Looking for weak points and exploring reactions to attacks in each situation is fun. It’s exhilarating to use your head in battle to skilfully defeat an opponent. The battles are a lot of fun." This is a refreshing comment to me. I appreciate the way it expresses the appeal of the game so straightforwardly. That’s right. I told the overseas media that even the battles involve puzzle-solving. Those words came out very naturally. In addition to the puzzles prepared by the developers, this game also has limitless puzzle-solving in the battles. Unlike battles carried out by pushing buttons, you can try all sorts of moves and discover how your opponents’ reactions change accordingly. Those in the media also said that is fun. That is common to everyone. Yes. 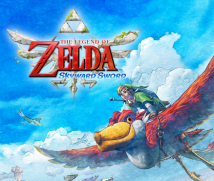 The Legend of Zelda was originally a single-player game, but I’ve always thought that The Legend of Zelda: Skyward Sword may be more fun played together with others. I wonder how others play, but I also want to show how I play. I think that feeling will naturally arise in those who play the game from now on. Friends and siblings and other family members having a good time playing together isn’t something that was possible in previous main games in the series, but I’m sure it must be fun. And aside from really sharp fighting methods, you may make some new discoveries by wildly swinging the sword around. "In the first few moments, when Link has the sword in his hands, I was surprised by the sense of immersion as I was playing the game. At the same time, for a little while afterward, I had to fight against my tendency to wildly swing the Wii Remote Plus controller around. In order to defeat an enemy, you have to observe their weak point and move with precision in accordance with it. But once you conquer that bad habit and master agile control of the game and sharply accurate swordplay, the real thrill of all kinds of fights, whether against weak opponents or big bosses, becomes clear." "My attitude towards Link has changed compared to previous games in the series. Before, I was controlling Link, but this time I become Link myself. That is totally different." That first comment is from the leader in charge of the French translation. We can imagine him getting used to the Wii Remote Plus controller as he describes his experience. People in Europe wrote about what they experienced as if it were a story. Reading their comments, how they felt comes across. It was like they couldn’t go without expressing their exact feelings as they were absorbed in the world of the game. The second comment is by someone who played the game 20 times! He mentions becoming Link. That’s deep. In The Legend of Zelda, you can see Link on the screen, so it’s in third-person perspective8, but this person felt a unison with Link. 8Third-person perspective: A point of view in which the player looks at and controls a character visible on the screen. Until now, there has been a fixed idea that unless a game is in first-person perspective9, there are limits to how much you can get into it. 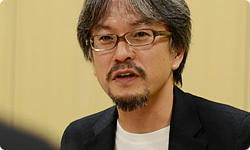 The Legend of Zelda: Skyward Sword may be able to overturn that. 9First-person perspective: A point of view that appears as if the player is within the game and shares the viewpoint of the player character.